Back in 1974, one of the most striking pieces of industrial design the world had seen surfaced in the shape of the Lecson AC1/AP1 preamplifier/ power amplifier combination. At a stroke, the two men behind it – Allen Boothroyd and Robert Stuart – marked themselves out as one of the greatest design partnerships in British hi-fi history. In 1977, the Meridian brand was launched to an unsuspecting world, the Boothroyd/Stuart partnership again showing itself as capable of conceiving one of the world’s most visually arresting combinations of form and function, in the 101/105 pre-power amplifier. This sounded superb by the standards of the day, and looked, worked and felt like nothing else on the market. Its stark minimalism was a dramatic contrast to the vast, button-festooned amplifiers coming out of Japan, for example. Meridian went from strength to strength, the company becoming one of the most successful British brands, and has never been anything less that highly respected since. 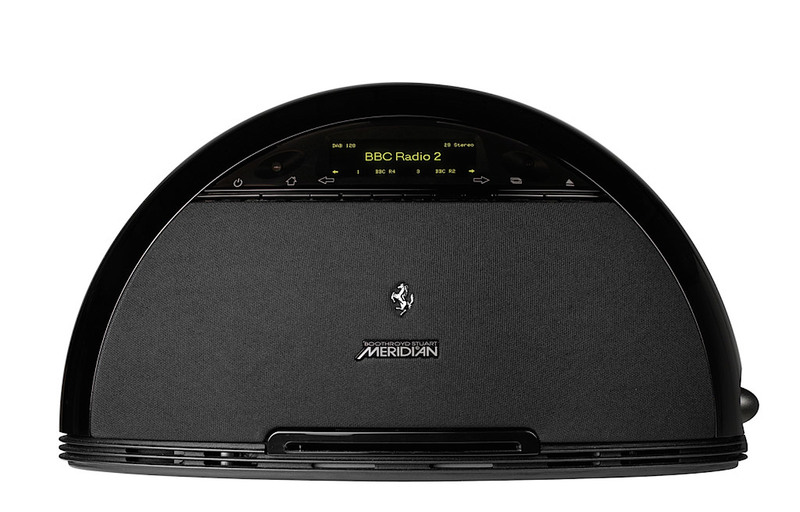 The Meridian F80 was launched in 2006 and sold for £1,495, but not as a serious ‘hi-fi separates’ product. Rather, it was an interesting side-project that grew wings and flew. By doing a joint venture with Ferrari, which supplied some of the construction technology, Meridian got to markets it could never previously have reached. Basically it was a very high quality portable music (and movie) centre – a glorified table radio with DAB/AM/FM and silver disc (CD, CD-DA, CD-R/RW, MP3, WMA, DualDisc, DVD-V and DVD-R/RW) functionality. But it was no pale Bose imitation, but real hi-fi in miniature, with all the technology that Meridian used (albeit in on a larger scale) in its separates. The elliptical shape is striking yet simple, and came in five official Ferrari colour options plus other limited edition luxury finishes. At the time of launch, Meridian said it built the F80 in the tradition of a proper ‘home wireless’, one that would be a focus for ears and eyes and fill a room with sound. Inside its high quality (408x230x185mm) plastic shell, the 6.5kg F80 sports a solid diecast metal base, and three loudspeakers mounted in separate, inert enclosures created from a special alloy-injected composite. “It was within this field of materials technology that Ferrari’s close co-operation and specialist expertise proved invaluable”, said Meridian. The electronics are impressive – there’s a DAB/FM/AM tuner with built-in antenna for local radio reception, and dual connections for external antennae. To give you an idea of the detailed thinking that lies behind the F80, these are individually assignable so you can use one AM, and the other for cable radio for example. The speakers are all under digital signal processing control, with three power amplifiers delivering 80W to the two front speakers, plus an integral rear subwoofer. The loudspeakers themselves are special full-range designs, custom-made with powerful neodymium magnets and cones fashioned from magnesium and aluminium alloy. All well and good, but for me it’s the display and control interface that really made the F80. The front of the unit has a superb fine-pitch dot matrix ‘organic LED’ display, which gives extremely comprehensive information. For example, in radio mode, it shows the station name, bitrate, stereo/mono mode, radio text and the station names of one bank of presets. Press the right hand arrow button and it displays the station names programmed into the next bank of presets. Switch source to disc, and it shows the track and time information, and the display above the row of buttons changes to offer other options. The idea then is that there’s an ‘adaptive interface’ – the lower display section, in conjunction with six unlabelled buttons in the central row of buttons, operates all the functions necessary. It works very well, requiring very little acclimatisation, and the only other control on the whole machine is a rotary volume knob on the bottom right had side of the case. The other key point is the F80’s connectivity. Around the back, there are sockets you’ll won’t find on any other mid-noughties ‘table radio’. There’s a 3.5mm minijack stereo input, optical digital input and output, a ‘dock’ input (for a forthcoming bespoke iPod dock), plus composite and S-Video outputs for the DVD player. All this means that the F80 does a better than average job of connecting up to the outside world. Sonically, I found this half moon-shaped Meridian to be like most hi-fi – it sounded mediocre out of the box. Given a good few ‘warm up laps’ however, things really shifted up a gear, and it really does sound rather good, which makes it quite unlike any other product of its type I’ve heard so far, including the likes of the B&O BeoSound One (£850) which was its closest price rival at the time. Like all modern Meridian kit, it has a very clean midband, with lots of detail and a sense of finesse that shows its high end origins. It is dry tonally – don’t expect the rich sound of an old valve table radio – but by no means stark. Rather, the F80 makes more than a half-hearted attempt at trying to reproduce accurately and in an uncoloured way, what’s on the disc (or radio). The Meridian impresses by giving real midband insight, yet doesn’t sound thin. The rear mounted subwoofer sees to that, by offering real bass reinforcement, but doesn’t seem boomy or semi-detached either. With a decent CD, you get a genuinely musically enjoyable sound, and this is even when you’ve just been listening to a serious separates system – it is taut, controlled, punchy and clean. Placement is of course an issue, and the sorts of locations the F80 is likely to find itself may not flatter it sonically. It’s best of all in open space in the centre of a room, but even shoved in a corner sitting at an angle, it still fills a medium-sized room with sound. Even when extended, the Meridian remains clean and undistorted, showing the benefit of its rigid internal construction – no rattles or hums here! Downsides? Well, it’s just a tad veiled in the treble (what do you expect, they are full range speakers!) and there’s the slightest hint of sibilance sometimes, when you’ve just switched on. The video isn’t amazing, especially by modern upsampling Blu-ray standards, but it’s still a great feature to have – ideal for bedrooms with small TVs for a spot of casual viewing. Brilliantly conceived, superbly executed and eminently ‘fit for purpose’, the F80 was an interesting moment for Meridian, and still a redoubtable portable performer today.